BLACKSBURG, Va., July 7, 2009 – The Barcelona Institute of Gospel will perform at Virginia Tech's Kentland Farm on Wednesday, July 15 from 4 to 8 p.m. This event is free and open to the public. This is the first of many concerts that the Spanish gospel choir will perform in Virginia and New York throughout July. Their tour was arranged by 2009 Virginia Tech graduate Morgan Cain Grim of Floyd, Va., who managed serendipitous occurrences that combined her undergraduate research with a study abroad opportunity. The Spanish choral group utilized a wide variety of music types and presents it with a “gospelized” panache. Selections will include traditional gospel hymns, as well as uniquely adapted versions of Beatles’ songs, or the theme song from Disney's The Lion King , or Tennessee’s “Rocky Top.” All songs are performed in English. The Kentland concert will be held on the lawn just outside of the main estate building. In addition to the concert, there will be a potluck, local crafts, and exhibitions. Attendees are encouraged to bring a dish for the potluck, which will take place at 6 p.m. followed by the concert. In case of rain, the festivities will be held in the Grange Hall in Prices Fork. Cain Grim, who completed her undergraduate degree in just three years in the College of Liberal Arts and Human Science’s Appalachian Studies Program, studied abroad last summer where she met the Barcelona group’s director, Oscar Alberdi, at a host family’s dinner gathering. According to Cain Grim, the two talked about African American history, the focus of her undergraduate research project the previous two years when she collected oral testimonies from the local Wake Forest community that had formed adjacent to the Kentland plantation. After watching the Barcelona Institute of Gospel perform, Cain Grim says she had additional discussions with Alberdi, who asked her to share her undergraduate research with the entire gospel group so they could learn about the religious history and culture of Wake Forest, Va. At the end of a four-week visit that included three invited lectures, Cain Grim agreed to help the choir come to the United States so that they could learn more about the culture, history, and life of some of the communities where gospel music was born. When Cain Grim returned to Blacksburg, she says she elicited sponsorship from diverse groups at Virginia Tech and the local community to compile a two-week agenda for the 20-member touring group. Inspired by how gospel music motivated oppressed African Africans to mobilize and challenge controlling forces during times of slavery and the Civil Rights Movement, Oscar Alberdi founded the choir for youth and young adults 12 years ago. According to Alberdi, the group formed around the idea that gospel music can offer hope in desperate times. Today the Barcelona Institute of Gospel uses the history, energy, and soul of gospel to inspire hope, unity, and charity among the underprivileged citizens of Barcelona, particularly children. 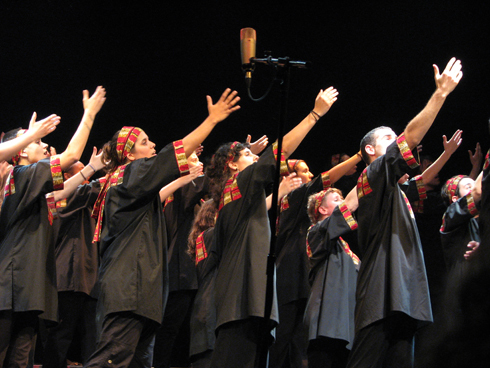 The institute, which became an official government sanctioned organization in 2001, runs the Barcelona gospel choir and also offers gospel singing courses and workshops with gospel music, history, vocal sessions, and choreography. The growth and success of the accredited institute, however, has not prevented the gospel choir from honoring its roots by continuing to provide free public concerts each week to passersby on the streets of Barcelona. Cain Grim has arranged for the 20 founding members of the institute to visit Harriet Tubman’s residence in Auburn, N.Y. While at Tubman’s home, the choir members will meet descendants of the famous abolitionist and humanitarian. They will also perform a “gospel opera” of her life that they composed and created just for this trip. The Barcelona Institute of Gospel’s visit to the United States is being sponsored by Virginia Tech’s Appalachian Student Organization, Appalachian Studies Program, Interdisciplinary Studies Student Organization, Spanish Club at Virginia Tech, the Office of Equity and Inclusion, the Black Student Alliance, Virginia Tech Humanities Program, and the Coal Mining Heritage Association of the New River Valley. Directions to Kentland Farm from Blacksburg: Prices Fork Rd. to a right on McCoy Rd. Proceed 3.2 miles and turn left on Whitethorne Rd. Go half a mile; the Kentland entrance will be on the right. Written by Lindsey Love, of Stafford, Va., a 2009 graduate who received a degree in communication from the College of Liberal Arts and Human Sciences.